Visitors to Massachusetts are entranced by the lighthouses that once served as an essential aid to navigation along the rocky coasts. Lighthouses function almost as small maritime museums, and some lighthouses, especially the keeper's quarters, do contain lighthouse museums and gift shops. Cape Cod, which juts 70 miles into the Atlantic, was called an ocean graveyard from the earliest years of sea exploration because of ilts shoals, treacherous waters, and frequent shipwrecks, The first lighthouse on Cape Cod was Highland Light in Truro, authorized by George Washington in 1796. See listings below for lighthouses that hosts museums, shops, tours, and life saving demonstrations. Our thanks to the generous help of Jeremy D'Entremont. See more lighthouses at www.lighthouse.cc. Photos by Jeremy D'Entremont. Open: The grounds are open year-round; the lighthouse tower is open in 2007 on April 14; May 19; June 2; July 5 and 19; August 2, 11, 16, and 30; December 1. Directions: Follow State Route 28 through Falmouth. From the north, turn right on Woods Hole Road (from the south, turn left and follow signs to Woods Hole). Travel three miles and turn left on Church Street. Parking in front of the lighthouse. The facility: Tours offered from 9:30-11:30 a.m. Admission is free. Attendance is heavy and it is not uncommon to wait an hour or more to tour the lighthouse. Early arrival is recommended. Station established in 1829; present tower built in 1876. Light flashes white every six seconds; fog signal is two blasts every 30 seconds. 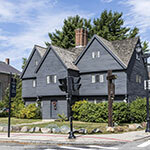 The keeper's house is home for the commander of Coast Guard Sector Southeastern New England. Accessibility: From May to October, the Trustees of Reservations present a daily natural history tour at Coskata-Coatue Wildlife Refuge (phone: 508-228-5646). A naturalist guide leads participants on an over-sand vehicle tour through the salt marsh to learn about the geology, ecology, and history of the area and to climb the Great Point Lighthouse. The facility: U.S. Coast Guard active aid to navigation, leased to the Trustees of Reservations. Lighthouse built 1784. Light flashes white every five seconds. Accessibility: Sunset tours are offered on Fridays, Saturdays, and Sundays from mid-June to mid-September. Tours are available from 90 minutes before sunset to 30 minutes after sunset. Call the Martha's Vineyard Historical Society for more information at 508-627-4441 or 508-645-2211. The facility: Active U.S. Coast Guard aid to navigation. Lighthouse built 1856. Light alternates red and white flashes each 15 seconds. Open: The grounds are open year-round; the lighthouse is open from May 1 to late October. Directions: From the south, take State Route 6 and turn right east on Highland Road. Watch for signs to Highland (Cape Cod) Light. Follow the signs to the lighthouse. The facility: The building houses an Interpretive Room where guests can watch a 10-minute video showing the history of the lighthouse. An observation deck is located at the edge of a cliff 120 feet above the Atlantic Ocean. Gift shop in the keeper’s house. Guided tours of the lighthouse tower are offered by the Truro Historical Society daily from 10 a.m. until 5:30 p.m. This lighthouse is an active U.S. Coast Guard aid to navigation, owned by Cape Cod National Seashore. Built in 1797 and reconstructed in 1857, Cape Cod Highland Lighthouse is the oldest and highest lighthouse on Cape Cod. Highland House (home of the Truro Historical Museum) is a short walk from the lighthouse. Open: Public tours change from year to year, but generally they are held twice a month, June through September, and once in October. The grounds are open year-round. Accessibility: Visitors can reach the lighthouse by parking at Race Point Beach and walking to the lighthouse (about 45 minutes). Visitors can also use their own four-wheel drive vehicle or contact Provincetown dune tour operators. Accessibility: The lighthouse is not open to the public and is best seen by boat.The facility: Active Coast Guard aid to navigation. Managed by Cuttyhunk Historical Society, PO Box 165, Cuttyhunk, MA 02713; phone: 508-971-0932 (summer). Lighthouse built 1891. Light flashes white every six seconds. Accessibility: The grounds are open all year; the lighthouse is sometimes open for open houses. The facility: Active Coast Guard aid to navigation; the lighthouse is owned by the City of Newburyport and is leased to the Friends of Plum Island Light, P.O. Box 381, Newburyport, MA 01950. Lighthouse built 1898. Occulting green light has two eclipses every 15 seconds. Accessibility: The lighthouse and grounds are not open to the public; the lighthouse is best seen by boat. The facility: Active aid to navigation managed by U.S. Coast Guard. Lighthouse built 1901. Light flashes white every 2.5 seconds. Accessibility:The lighthouse, built in 1855, is now part of the Lighthouse Inn, operating spring through fall. The facility: The light went into service in April 1855, with a fifth-order Fresnel lens, but it was extinguished in 1914, when it was deemed unnecessary. The property was sold to the Harry K. Noyes family and used as a summer home. In 1938, State Senator Everett Stone bought the property as a home and he and his wife entertained overnight guests at the lighthouse so often they opened it to the public as the Lighthouse Inn. In the summer of 1989 the Stone family had the lighthouse re-lighted as a seasonal aid to navigation. 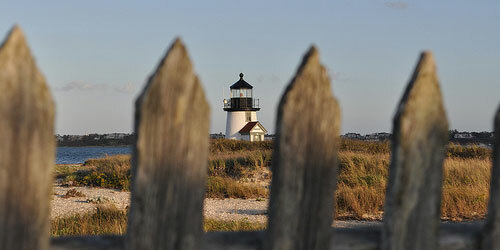 It was officially designated West Dennis Light and it operates each summer. Accessibility: The lighthouse is not open to the public. The Gurnet is accessible by four-wheel-drive vehicle from Duxbury Beach, but the road to the lighthouse is not open to the general public. There may be occasional open houses, including during Duxbury's Opening of the Bay festival in May. The facility: Active Coast Guard aid to navigation; lighthouse managed by Project Gurnet and Bug Lights, P.O. Box 2167, Duxbury, MA 02331. Lighthouse built 1843. Light flashed three times every 30 seconds with a red sector; fog signal is one blast every 15 seconds. Accessibility: The lighthouse is located in Chandler Hovey Park on Marblehead Neck. The grounds are open all year; there is a small parking lot at the park. The lighthouse is open by special arrangement only. The facility: Active Coast Guard aid to navigation; tower is maintained by Town of Marblehead. Lighthouse built 1896. Light is fixed green. Accessibility: Fort Taber Park and the Clark's Point Lighthouse are reached by following Route 18 in New Bedford to a traffic light at its southern end. Turn left at the light and continue for two miles to the park entrance. The fort and lighthouse are not open to the public, but good photo opportunities are available from the grounds. The facility: Maintained by the City of New Bedford. Lighthouse built 1869. Light is fixed white. Accessibility: The island is closed to the public; the lighthouse is best seen by boat. It can be seen distantly from the end of Bearskin Neck in Rockport. The facility: Active Coast Guard aid to navigation; island is owned by Massachusetts Audubon Society. Lighthouse built 1896. Light flashes green every six seconds; fog signal is one blast every 15 seconds. Open: The grounds are open to the public, but the lighthouse is not. Accessibility: Long Point is accessible in summer from Provincetown via a boat shuttle run by Flyer's. The lighthouse can also be reached after a long strenuous hike across a breakwater to Wood End, then across sand to Long Point. The facility: This lighthouse is an active U.S. Coast Guard aid to navigation. Station established in 1826; current lighthouse tower built in 1875. The lighthouse operates a fixed green light; the foghorn sounds once every 15 seconds. Accessibility: The grounds around the lighthouse are open all year. The tower is open only during occasional open houses. The facility: Active private aid to navigation, managed by Scituate Historical Society, Scituate, MA 02066; phone: 781-545-1083. Lighthouse built 1811. Light flashes white every 15 seconds. Accessibility: The land surrounding the lighthouse is privately owned and is not open to the public. The best views are from the water. Accessibility: There is limited, short-term parking for visitors at the lighthouse. Directions: From Route 127 in Gloucester, turn onto Leonard Street. Turn right at the sign that says Norwood Heights and follow to the end. Annisquam Light may also be viewed from across the river, from Wingaersheek Beach in Gloucester. The facility: Active U.S. Coast Guard aid to navigation; keeper's dwelling serves as housing for a Coast Guard family. Lighthouse built in 1897. Light flashes white every 7.5 seconds; fog signal is two blasts every 60 seconds. Accessibility: The lighthouse is not open to the public. It can be seen distantly from the Plymouth waterfront but is best seen by boat. The facility: Active U.S. Coast Guard aid to navigation maintained by Project Gurnet and Bug Lights, P.O. Box 2167, Duxbury, MA 02331. Lighthouse built 1871. Light is two red flashes every five seconds; fog signal is one blast every 15 seconds. Accessibility: Members of the public can visit using their own boat or kayak, but there is no dock on the island, only the ramp used by the Thacher Island Association's launch. Only small rowboats and kayaks are allowed to land on the ramp. Two guest moorings are available about 50 yards offshore. To use one of these moorings, call the caretaker in advance at 978-546-2326. Bring a dinghy to land on the ramp. The facility: The south light is an active Coast Guard aid to navigation. The north light is managed by the Town of Rockport and the Thacher Island Association, P.O. Box 73, Rockport, MA 01966. A six-room apartment is available in the assistant keeper's dwelling; call 617-599-2590 for information and reservations. Those wishing to camp on the island may obtain a permit by calling 978-546-2326. Lighthouse built 1861. South light flashes red every five seconds; north light is fixed yellow; fog signal is two blasts every 60 seconds. Accessibility: The lighthouse is not open to the public. It is best viewed from the Borden Light Marina in Fall River. The facility: Active U.S. Coast Guard aid to navigation. Lighthouse built 1881. Light flashes white every 2.5 seconds; fog signal is one blast every 10 seconds. Accessibility:The lighthouse is privately owned and is not open to the public. Good views are possible from Harding's Beach. The facility: Station established and keeper’s house and tower were built in 1880; deactivated in 1933. Keeper’s house still stands. Accessibility: The lighthouse is not open to the public. It can be seen distantly from points along the shore of Cohasset and Scituate, but is best seen by boat. The facility: Active Coast Guard aid to navigation. Lighthouse built 1860. Light flashes white; fog signal is one blast every 10 seconds. Open: The lighthouse is privately owned and is not open to the public. The best views are from the water or from nearby Keyes Beach. Accessibility: Sunset tours are offered on Sundays from mid-June to mid-September. Tours are available from 90 minutes before sunset to 30 minutes after. Contact the Martha's Vineyard Historical Society for details. The facility: Active Coast Guard aid to navigation. 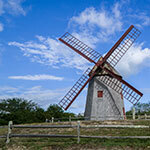 Maintained by Martha's Vineyard Historical Society, Box 827, Edgartown, Massachusetts 02539; phone: 508-627-4441. Lighthouse built 1878. Light is a three-second green flash alternating with three seconds of darkness. 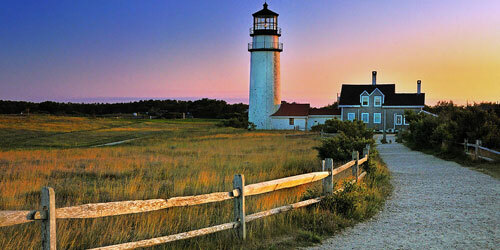 Accessibility: The lighthouse grounds are open year-round as part of the Cape Cod National Seashore. Ranger-guided tours of the buildings are offered during the summer. Directions: State Route 6 to Eastham; turn right on Nauset Road. Follow signs to Nauset Lighthouse. The facility:The original lighthouse at Nauset was built in 1837, and was constructed as three brick towers to distinguish it from the single light at Highland and the twin lights at Chatham. Accessibility: A 75-minute tour is available through the Trustees of Reservations (phone: 508-627-7689). Reservations are required. The facility: Active U.S. Coast Guard aid to navigation. The lighthouse may be open to the public periodically in summer to those with their own four-wheel drive vehicles. Check at the gatehouses. Property managed by Cape Poge Wildlife Refuge, Chappaquiddick Island, Martha's Vineyard, MA; 508-627-9931. Lighthouse built 1893. Light flashes white every six seconds. Open: The lighthouse is not open to the public and is best viewed by boat. The facility: Active U.S. Coast Guard aid to navigation. Station established and current lighthouse tower built in 1943. Light flashes white every 10 seconds and fog signal is one blast every 15 seconds. Accessibility: The tower is open during July and August, Thursdays, 10 a.m. to noon. Contact Bert Theriault at nedspointlight@comcast.net for more information. The grounds are open to the public every day. The facility: Active Coast Guard aid to navigation; grounds are the property of the Town of Mattapoisett. Lighthouse built 1838. Light flashes three seconds of white alternating with three seconds darkness. Accessibility: The lighthouse is privately owned and is not open to the public. It is best seen by boat and can be seen from whale watches leaving Barnstable Harbor. The facility: The station was established in 1826; present tower was built in 1857 and deactivated in 1931. The keeper’s house, built in 1880, still stands. Accessibility: The lighthouse is not open to the public and is best seen by boat. The facility: Private aid to navigation maintained by Bird Island Lighthouse Preservation Society at 2 Spring Street, Marion, MA 02738; phone: 508-748-0550. The facililty: Lighthouse built 1819. Light flashes white every six seconds. Accessibility:The Monomoy Island Ferry offers a variety of trips, including visits to the island. The Friends of Monomoy may offer programs that include an overnight stay in the keeper's house; call 508-945-0594 for current information. The facility: Station established in 1823; present lighthouse and keeper’s house built in 1849; deactivated in 1923. The property is now managed by the U.S. Fish and Wildlife Service. Accessibility: The grounds are open to the public but the lighthouse is not. Reaching the lighthouse from the ferry requires a car or bicycle. The facility: Active Coast Guard aid to navigation. Lighthouse built 1850. Light flashes white every 7.5 seconds. Accessibility: The lighthouse is not open to the public. It can be seen from points along the shore in Winthrop (Shore Drive), Hull (Nantasket Beach), and Nahant, but is best seen by boat. The facility: Active U.S. Coast Guard aid to navigation. Lighthouse built 1905. Light flashes two white flashes every 12 seconds; fog signal is two blasts every 20 seconds. Directions: From State Route 28, bear southwest at the Chatham rotary to Main Street. At the end of Main Street, turn right onto Shore Road. The facility: This lighthouse is a U.S. Coast Guard station and an aid to navigation. The lighthouse and keeper’s house were built in 1808. In November 1870 a nor’easter smashed the barrier beach and started a pattern of erosion that would later undermine 228 feet of land in front of the lighthouse. In 1877 two new lighthouses and a keeper’s house were built west of the road. Within the next four years, the earlier lighthouses toppled into the sea. In 1923, the north tower was moved to Nauset in Eastham. During a nor'easter in October 1991 part of the overlook and parking lot washed away, but the overlook has been restored. Accessibility: Winter Island Park is open all year. In summer there is a parking fee, except for residents of Salem. To reach the park, follow Webb Street toward Salem Willows; turn right at the sign for Winter Island. The facility: Lighthouse built 1871. Managed by Winter Island A Marine Recreation Park, 50 Winter Island Road, Salem, MA 01970; phone: 978-45-9430. Light flashes white every four seconds. Accessibility: This lighthouse no longer exists (replaced by modern fiberglass structure). The modern tower can be seen from many sightseeing cruises leaving Boston and from a public trail around Deer Island. The facility: Lighthouse built 1982. Light flashes alternately white and red every 5 seconds. Accessibility: The grounds are open to the public; the lighthouse is within walking distance of the ferry landing. The tower is not open to the public. The facility: Active U.S. Coast Guard aid to navigation. Lighthouse built 1901. Light flashes red, eclipsed every four seconds; fog signal is one blast every 10 seconds. Open: In 2010, open all Sundays from May 9 through October 31. Also open on Wednesdays in July and August. Tours held 1-4 p.m. Directions: Take Route 6 to Bracket Road; turn right onto Bracket Road. Follow to end and turn left onto Nauset Road. Take first right onto Cable Road. At end of Cable Road, turn left onto Ocean View Drive. 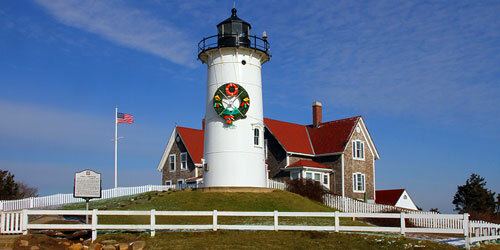 The facility: The current beacon at Eastham was originally built in 1887 as one of the twin lights at Chatham. In 1923, it was moved from Chatham to replace the last of the Three Sisters Lighthouses. Erosion threatened the survival of the lighthouse, and in 1993 the Coast Guard proposed decommissioning it. 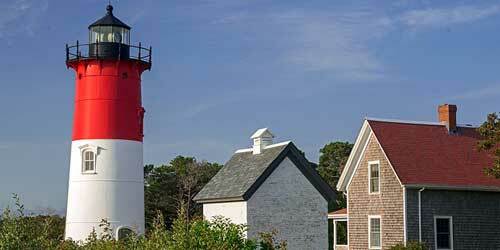 The Nauset Light Preservation Society financed a project to move the lighthouse further inland. By 1996, the light was moved away to its present location. 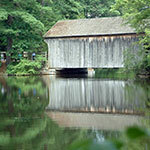 It is located in the Cape Cod National Seashore and managed by the preservation society. Accessibility: The lighthouse and grounds are not open to the public. It is best seen by boat. The facility: The lighthouse is available for rent. Contact Wing's Neck Lighthouse Trust at 508-460-0506. Lighthouse built 1890. Accessibility: The lighthouse is not open to the public, but good views are possible from the road. The facility: Active Coast Guard aid to navigation. Lighthouse built 1891. Light is white, occulting every four seconds with red sector. Accessibility: The lighthouse is open to private boaters by arrangement. 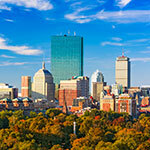 Call 617-223-8666. Boaters must drop off passengers and anchor offshore. There are also public tours in season, on Thursdays, Fridays, Saturdays and Sundays. The Friends of the Boston Harbor Islands also run occasional cruises to the island. The Friends can be reached at 349 Lincoln Street, Hingham MA 02043; 781-740-4290. The facility: Lighthouse built 1783. Light flashes white every 10 seconds; fog signal is one blast every 30 seconds. Accessibility: The lighthouses are not open except by special arrangement. The rear tower is easily seen on Water Street between Federal and Independent streets. The facility: Lighthouse built 1873. Accessibility: The lighthouse is not open to the public except by special arrangement. It can be reached on foot at low tide via the hurricane wall in New Bedford Harbor, and can be seen from the ferry from New Bedford to Cuttyhunk Island. Maintained by the city of New Bedford. The facility: Lighthouse built 1849. Light flashes white, two seconds on, six seconds off. Accessibility: The lighthouse is at the end of Derby Wharf, which is open all year. The lighthouse itself is not open to the public. 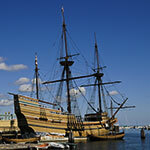 The facility: Managed by the National Park Service, Salem Maritime National Historic Site, 174 Derby St., Salem, MA 01970. Lighthouse built 1871. Light flashes red every six seconds. Accessibility: The lighthouse is not open to the public. It can be seen from the shore along East Rodney French Boulevard, and from the ferries leaving New Bedford for Martha's Vineyard and Cuttyhunk. The facility: Active private aid to navigation. Maintained by City of New Bedford. Lighthouse built 1898. Light flashes white every four seconds. Accessibility: The island is open to private boaters, but there is no landing facility except a small sandy beach. The lighthouse is not open to the public and is best seen by boat. The facility: Active U.S. Coast Guard aid to navigation; grounds managed by the City of Gloucester. Lighthouse built 1881. Light flashes three seconds red alternating with three seconds darkness; fog signal is two blasts every 20 seconds.